You may have noticed I have a bit on an interest in exploring ways of using digitised historical newspapers. In the last year or so I’ve spent a lot of time scraping, mining, processing and visualising content from the Trove collection of digitised Australian newspapers. But what about other countries? Recently I was invited to a digital history workshop organised by Sydney Shep (@nzsydney) at the Victoria University of Wellington. In between sessions I started to play with the DigitalNZ API guided by Chris McDowall (@fogonwater). In anticipation of the forthcoming Trove API I’d already done a bit of work converting QueryPic to run in the browser. It didn’t take long to adapt this to work with New Zealand newspapers available through Papers Past. So presenting for your enjoyment and education… QueryPicNZ. It’s limited to simple word or phrase searches at the moment, but eventually I’ll add the ability to process more sophisticated queries. I also want to add a way of saving, sharing and citing graphs. For now the ‘share’ link simply regenerates the graph, so if the content has changed the result could well be different. 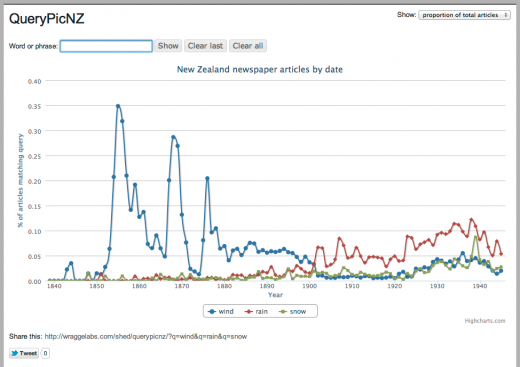 Ultimately, I want to combine Trove and Papers Past so that you can query and combine content from either Australia or New Zealand… perhaps even other countries? As you may know, I’ve recently embarked on an analysis of the movement in my New York Times column (not to say, blog) and the fourth essay in the series — http://bit.ly/H4Suf4 — makes reference to your tools and technical experiments. It offers, I’m afraid, a bit of a challenge to the renegade premise underlying your work.